Please refer to our stock # 1808 when inquiring. Blinding brilliance bounces off these carved faceted natural golden honey cognac amber beads along this half moon shape hair pin ornament comb tiara that flips up and down on its antique Victorian gold gilt frame over the double tine tooth horn section. Circa 1900. Crazing semi circular drill marks. See image 2. 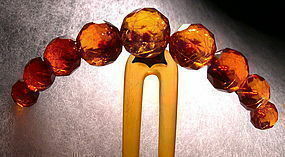 Largest amber bead: Nine carved and faceted with the middle one at 16mm X 10 mm thick - graduates to 10mm at both ends, forming a fiery brilliant half moon shape to enhance any hair style! Color varies slightly from a golden honey to cognac depending on light source. 3 5/8" across X 4" north to south with the flip up. What a flash for that on the town special hair do or for the opera! Pre owned vintage condition with a some of the gilt rubbed off, normal for 100 years of age. $14 USPS Priority/Ins/Track or FREE with your USA Ck or USPS MO. Victorian Carved Honey Amber Cross Necklace Gold Gilt Vintage Carved Gold Black Coral Bypass Bangle Snake Bracelet Vintage Chinese Peking Glass Bangle Blue Orange Green Asst.